Verily, one measurement trumps a thousand opinions: I was totally wrong about the door seal. Either that or the safe’s contents started out a lot wetter than I thought. 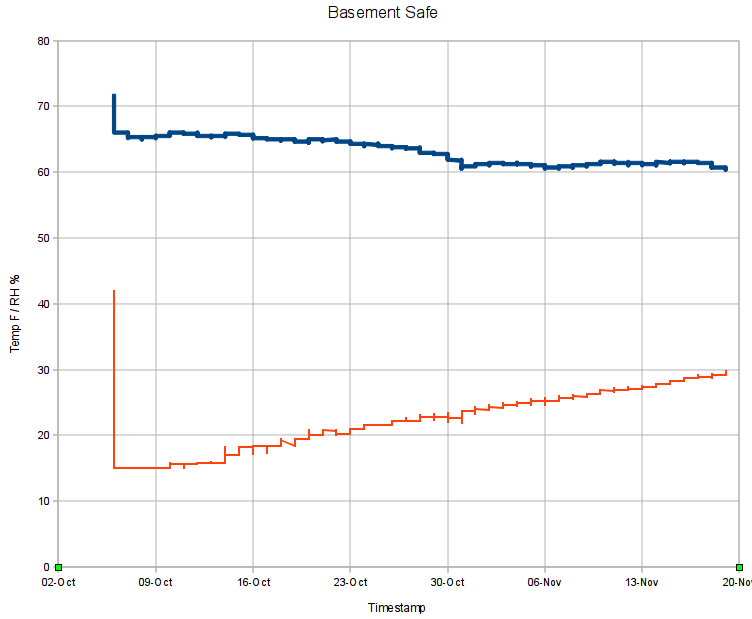 The basement humidity runs about 55% RH, pumped down by a dehumidifier in the summer and ambient air in the winter, which (I think) sets the upper limit. Modulo having hygroscopic stuff like paper in the safe, I suppose. I’ll toss a fresh bag in there, tape over the door crack, and see what happens during the next month. FWIW, the Onset HOBOware program doesn’t run under Wine and Wine doesn’t support USB hardware anyway, which is one of the few reasons I have a Token Windows Laptop. I’ve set it up to automagically export the data into CSV files, from which this went into OpenOffice 3.2 for a quick look. Surprisingly, HOBOware is a Java program, but evidently written specifically to avoid portability; they have Windows and Mac versions and that’s all. Worse, there’s no way to extract data from the loggers without using that program, because Onset doesn’t document the interface protocol. Enough said. Memo to Self: measure it!